We love the sound of rockets in the morning! I feel alright about taking some liberties with Lt. Col.'s famous quote because, well, it's just so darn true. In case you haven't heard, there's a Dragon above our heads now, at least for a little while. A few hours ago (at about 7:45 Pacific time), Space Exploration Technologies--more commonly known as SpaceX--achieved the successful launch of their second Falcon 9 rocket, and the first launch of their reusable Dragon spacecraft. Maiden voyages in the space exploration business don't come with terribly good statistics, and second launches are not all that much better, so all of us here at X PRIZE headquarters were doing our best to keep our expectations realistic--reading Alan Stern's instant classic OpEd on the issue was immensely helpful--but in the end, that appears not to have been necessary. 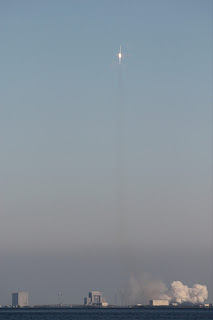 From everything we could tell, today's launch was a complete success. And although the Dragon capsule's mission won't be complete until a few hours from now when (knock on digital wood) she splashes back down and is successfully recovered, we can already say that the Dragon portion of the mission was at minimum a partial success. It's amazing to note that that would (will!) be the first time a commercial entity ever successfully re-entered a resuable vehicle from orbit. 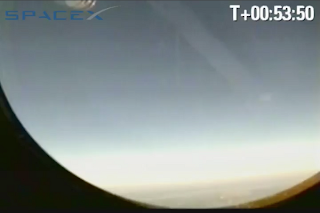 Update As of 11:05 am Pacific, Dragon had successfully re-entered and splashed down on target! That means, from all available data thus far, the mission was a complete success. It's inevitable that as the team at SpaceX goes through the data, they will find small flaws and areas of improvement (it seemed that the umbilical caught on fire at launch, and I'm hearing that perigee was a few percentage points lower than expected)--but that is expected and, for the most part, a good thing. Wow--truly an inspiring acheivement. In the words of our Founder and CEO here at the X PRIZE Foundation, Peter Diamandis, "In NASA's new plans for space exploration, a new player has taken center stage: American capitalism and entrepreneurship. Today’s SpaceX success strengthens my hope that entrepreneurial commercial space companies will at long last remove the cost barrier that slows our exploration of the solar system." You may also want to watch this video, which, although it isn't in HD, does continue all the way through to onboard footage of the stage separation and Dragon deployment (it's also got a little bit better rockety sound at launch). 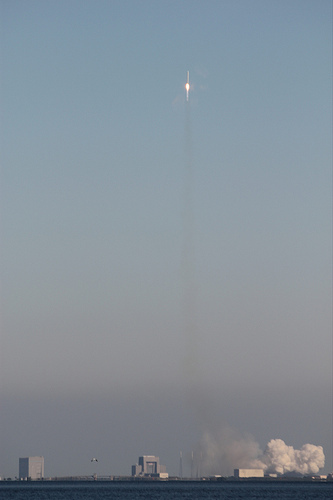 Today's launch was "COTS-1," so named because it was the first demonstration launch SpaceX performed under NASA's Commercial Orbital Transportation Services program. A PDF fact sheet about the vehicle, the mission, and SpaceX's role in the COTS program can be found here. The quick version is that COTS is an innovative, cost effective program that is encouraging private companies new and old to complement NASA's own skills and to reduce the USA's reliance on a single (non-American) rocket for resupply of the International Space Station after the upcoming retirement of the Space Shuttle fleet. Although SpaceX will very deservedly claim the spotlight today, it's important to recognize that they are not the only player here, nor the only winner. We at the X PRIZE Foundation enjoy a particularly close relationship with SpaceX--they are, after all, the Preferred Launch Provider for the Google Lunar X PRIZE--we are equally enthusiastic about the forthcoming launches from the other COTS winner, Orbital Sciences, and from the firms working on early stage technologies for a eventual crew follow on to the current cargo launch capabilities, Blue Origin, Boeing, Paragon Space Development Corporation, and the United Launch Alliance. When these companies develop new and useful capacities at fixed costs to the taxpayer, with large amounts of private matching and milestone-based payments to ensure performance, everyone wins. So, our heartfelt congratulations go out to all of our friends at SpaceX and at NASA. Today is a very good day! Launch photo by Flickr user Flying Jenny, used under a Creative Commons license. Dragon on-board photo by SpaceX.